Welcome to the Benares Restaurant. This is the first independent venture by Atul Kochhar who is one of London's most celebrated chefs. Welcome to Bengal Quay Indian Restaurant with take away and delivery service. 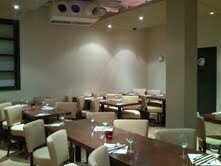 Come & dine in our contemporary designed restaurant, in a cool and relaxed atmosphere.